I hear this often and heard it again at the last CNPS conference from CNPS members: “I don’t know what to think about ‘comprehensive’ theories like those of Soyan Sarg, Vladimir Ginzburg, James Carter“, or now, George A. Adriaenssen. It is actually a good question. Let’s face it, when someone gives a comprehensive model of the universe, it sort of nullifies all the work anyone else is doing. The message is: “hey stop what you are doing, I have found the best model to date for the universe”. But, then I remember what my friend Neil Adams said several times at talks at our conferences: “We all own part of the truth”. No matter how complete the model, it is always incomplete. And George Adriaenssen’s new book “Post-Relativity Physics (PRP), A Work in Progress” tries to propose a model for the universe. Given my own thesis that physics should and must allow and have various models for the universe just like other professions have different solutions to the same problem, we should all look at these amazing attempts to model everything. Denmark born, Adriaenssens was, not hold it: an ELECTRICAL ENGINEER! Yes, I’m surrounded by electrical engineers. But they seem to make damn good physicists! Retiring in 1998, George has been working on physics for decades and currently lives in the Atlanta area in Georgia in the United States. George’s passion was Special Relativity and its problems. That lead him to a much longer journey than he thought, and today, he has a book of that long journey which he subtitles “A Work in Progress”. We in the CNPS use the word “aether” to mean aether theories instead of the molecule word “ether”. This we find confusing. George uses the word “ether” in his book but I’m translating this to aether. His work is an aether-based theory based on toroids or “rings” (a common dissident theme) that rotate against each other at right angles creating sort of a “rotating wheel” latticework. 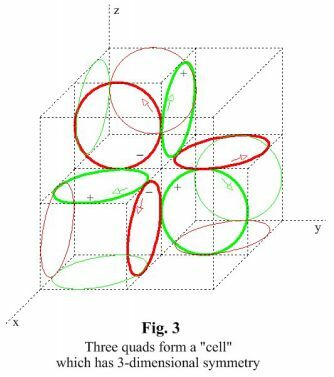 A “quad” are four rings that are flat-sided so they rotate against each other and keeping themselves in line. Quads on the left from an oblique angle, top view on the right. 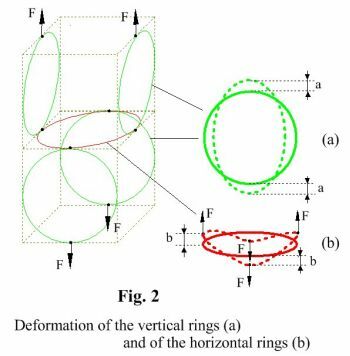 This is the essence of gravitation: compensating the slight contraction inside the atom by a mechanical stretching of the aether rings in the space surrounding the atom. For a large collection of atoms, the gravitation is proportional to the total reduction in size of the atoms in the collection. Inside the atom all the rings are lengthened radially (due to the cooperating forces from the nucleus and the electrons) and contract laterally so that the size of the atom is slightly reduced. Outside the atom this reduced size exerts a mechanical force on the surrounding ether, which falls off like 1/r. This force is not electromagnetic because the forces caused by the charges of the nucleus and of the orbiting electrons cancel each other. The mechanical gravitational force is transmitted via the nodes which hold the ether lattice together. Adriaenssen goes onto describing other phenomena that his model can explain including the bending of light by gravity, the precession of Mercury’s Perihelion, the Hubble Shift, the big bang, cosmic background radiation, and even the geometrical progression of the orbits. You can read more about this on Adriaenssen’s website: PRP. One thing in common all the “modelers” have is showing their models have a broad-range of explaining data and real-world experiments. George talks about is Special Relativity, the Michelson / Morely experiment, the Sagnac Effect, and quite a lot of other experiments involving light – all with the intention of showing that PRP has straightforward explanations. These are all topics that are very familiar to CNPS members. Adriaenssen also goes into detail about the fundamental flaws with special relativity. These explanations can be found on his website at this link: A Critique of Special Relativity. Although mainstream science deems their theories as “correct” and there can only be one, we in the CNPS propose that the universe will not only survive with numerous models, but thrive. And certainly George A. Adriaenssens’ “Post-Relativity Physics” model is one worth looking at remembering as the author himself states: “A Work in Progress”. This book and his work show the effort of many man years both in concept, structure, calculations, and applying the model to many of the experiments that interest the dissident community.